This is my library area. I used the portable closet on the righthand side to block of the area for private reading. I brought in additional throw pillows and used the beanbags again that I've had in the past. I rearranged my books some this year use crates that I ziptied together to create a bookshelf. I found I needed to add extra support due to the weight of the books, so I had a board cut that fit just right in between the two rows of crates. I am still in the process of leveling (with color coded electrical tape by AR level since that is what our students are accustomed to). I am sorting the books by genre, theme, and author to make it easier for students to find books they like. This is my reading table obviously. I made a focus board this summer using an oil drip pan from Walmart. 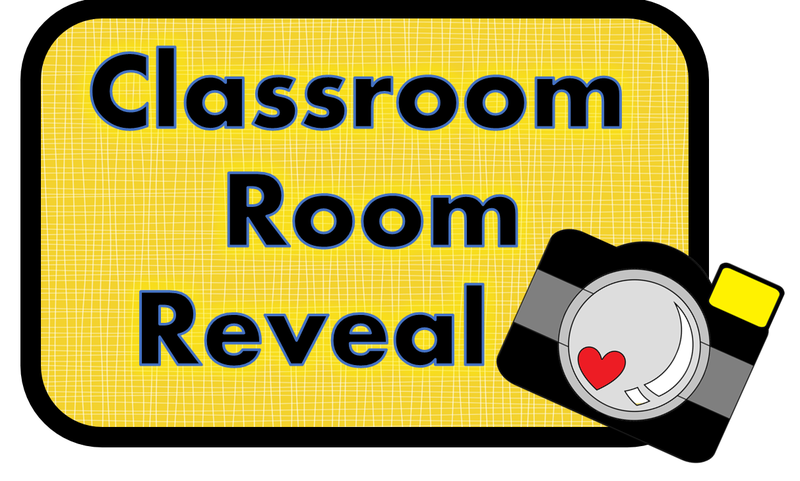 I will be using chart paper for modeling, have a place to post our reading vocabulary and phonics elements, and finally, a place to model spelling patterns. I will probably not use all board sections with a group, but have that as a possibility. In the corner of my room, you see the reading vocabulary wall. That includes terms often seen in state testing materials. Under the board, I've put together a crate/basket for all of the kindergarten word building manipulatives. 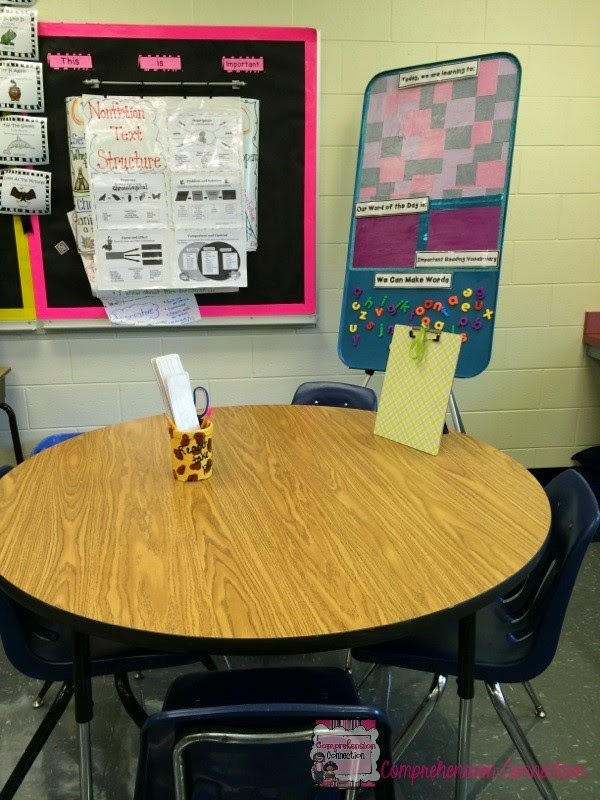 Here is a second reading area that will be used by our teaching assistant if she's working with me at the time. Again, the anchor charts are displayed as well. 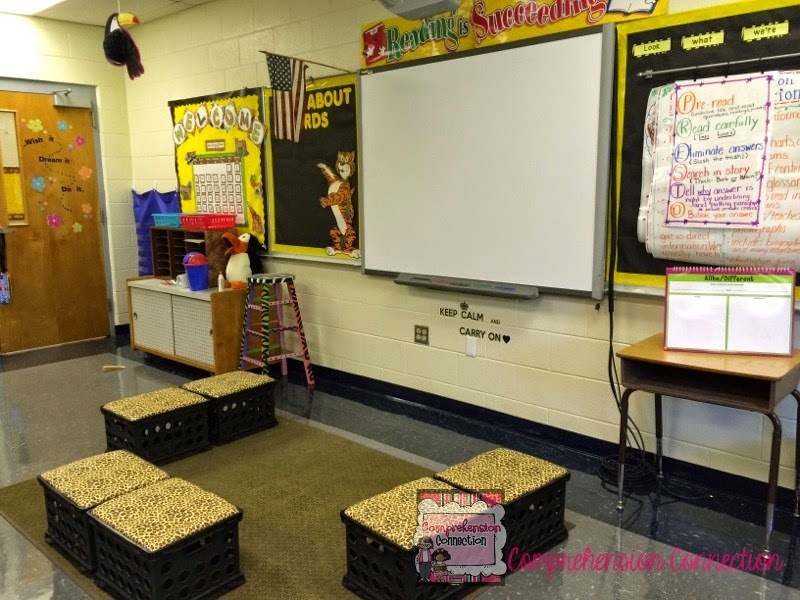 I may also use this area for centers if I am solo and need activities while I run groups. 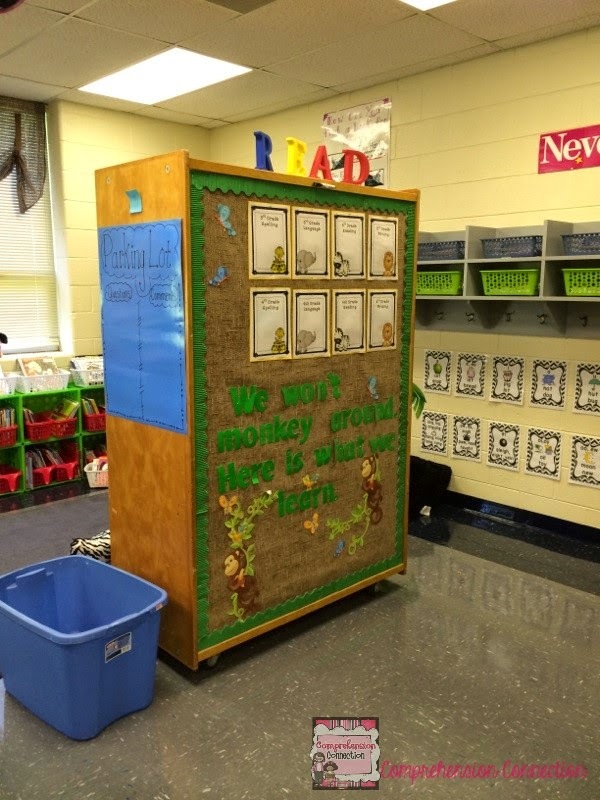 The final picture is of our book bins. Once the children start, each will have their own bin where they will place 3-4 books they want to read for independent time. 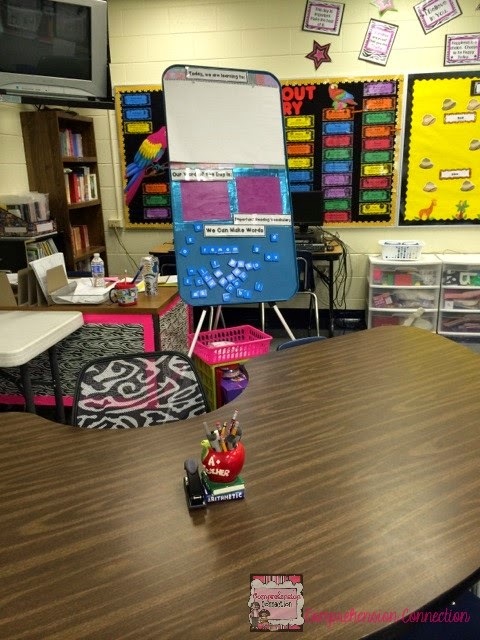 I have placed their interactive notebooks in them for now, and they will keep track of their reading in it this year. We will be running the 50 book challenge in my room, and I hope at the end of the year, I'm able to say each child did it. The children will start with me next week after we finish assessing. I can't wait to hear how they like this year's space. The space is just beautiful! 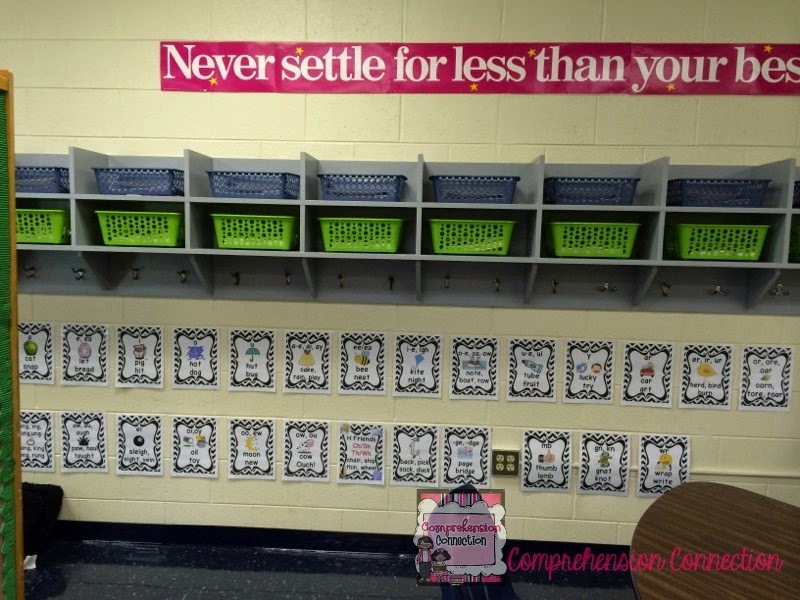 Very tidy, organized, and inviting!